Types of Mesothelioma include pleural mesothelioma, peritoneal mesothelioma and pericardial mesothelioma. Mesothelioma cancer affects the mesothelial tissue lining of the body's three largest cavities; the pleura (lung cavity), the peritoneum (abdominal cavity) and the pericardium (heart sac). A type of malignant mesothelioma is based on the section of the mesothelium that it affects. Mesothelioma is a form of cancer that is almost always caused by exposure to asbestos. In this disease, malignant cells develop in the mesothelium, a protective lining that covers most of the body's internal organs. Its most common site is the pleura (outer lining of the lungs and internal chest wall), but it may also occur in the peritoneum (the lining of the abdominal cavity), the heart, the pericardium (a sac that surrounds the heart) or tunica vaginalis. Most people who develop mesothelioma have worked on jobs where they inhaled asbestos particles, or they have been exposed to asbestos dust and fiber in other ways. Washing the clothes of a family member who worked with asbestos can also put a person at risk for developing mesothelioma. Unlike lung cancer, there is no association between mesothelioma and smoking, but smoking greatly increases risk of other asbestos-induced cancer.Compensation via asbestos funds or lawsuits is an important issue in mesothelioma . Pleural mesothelioma is the most common type of malignant mesothelioma (accounting for an approximate 75% of all documented cases of the disease) and affects the section of the mesothelium called the pleura. Although the most common type of malignant mesothelioma, the disease is still somewhat of a rarity. As a result, pleural mesothelioma is often confused with other types of diseases, such as lung cancer and viral pneumonia. Lung cancer can be caused by asbestos (asbestos lung cancer), though it differs from pleural mesothelioma in that it is a malignancy of the lung tissue itself, as opposed to pleural mesothelioma which is a malignancy of the tissue casing of the lungs. Viral pneumonia shares certain symptomatic similarities with pleural mesothelioma and is often misdiagnosed as such. Prognosis in this disease is difficult to assess consistently because there is great variability in the time before diagnosis and the rate of disease progression. In large studies of pleural mesothelioma patients, important prognostic factors were found to be stage, age, performance status, and histology. Histology means the specific type of mesothelioma cancer cells that are found. Various surgical procedures may be possible in selected patients. They typically provide long-term survival without cure. For patients treated with aggressive surgical approaches, factors associated with improved long-term survival include epithelial histology, no cancer found in the lymph nodes, and negative surgical margins. That means that the surgeons were able to remove all of the cancer, as far as they can tell, and there is a margin of healthy tissue around the tumor that they removed. For those patients treated with aggressive surgical approaches, nodal status is an important prognostic factor. In other words, if you had cancer in your lymph nodes your prognosis is worse than if no cancer was found in the nodes. Patients with stage I disease have a significantly better prognosis than those with more advanced stages. Because of the relative rarity of this disease, exact survival information based upon stage is limited. A proposed staging system based upon thoracic surgery principles and clinical data is shown below. It is a modification of an older system. Other staging systems that have been employed include the current international TNM staging system. Stage I: Disease confined within the capsule of the parietal pleura (i.e., ipsilateral (on the same side) pleura, lung, pericardium, and diaphragm). Stage II: All of stage I with positive intrathoracic (N1 or N2) lymph nodes. Stage III: Local extension of disease into the following areas, e.g., chest wall or mediastinum, heart or through the diaphragm or peritoneum, with or without extrathoracic (outside of the thorax) or contralateral (on the opposite side of) (N3) lymph node involvement. Stage IV: Distant metastatic disease, meaning spread of the cancer to distant sites. These stages are then put into two groups: Localized malignant mesothelioma, which is defined as stage I described above; and advanced malignant mesothelioma which includes stages II, III, and IV above. In practice, mesothelioma is generally categorized as either localized or advanced and the stage numbers like stage II or III are not used. Standard treatment for all but localized mesothelioma is generally not curative. Although some patients will experience long-term survival with aggressive treatment approaches, it remains unclear if overall survival has been significantly altered by the different treatment modalities or by combinations of modalities. Surgery and chemotherapy are examples of different treatment modalities. Extrapleural pneumonectomy in selected patients with early stage disease may improve recurrence-free survival, but its impact on overall survival is unknown. Extrapleural pneumonectomy is surgery to remove a diseased lung, part of the pericardium (membrane covering the heart), part of the diaphragm (muscle between the lungs and the abdomen), and part of the parietal pleura (membrane lining the chest). Pleurectomy (removing the pleura) and decortication (removal of part or all of the external surface of an organ) can provide relief from symptomatic effusions, discomfort caused by tumor burden, and pain caused by invasive tumor. Operative mortality from pleurectomy/decortication is less than 2%, while mortality from extrapleural pneumonectomy has ranged from 6% to 30%. Given the high mortality rate from a pneumonectomy, it is important to find a surgeon who has significant experience in doing such an operation. 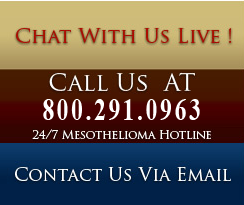 See our list of mesothelioma specialists to find experienced surgeons (http://www.mesorfa.org/specialist.htm). The addition of radiation therapy and/or chemotherapy following surgical intervention has not demonstrated improved survival. The use of radiation therapy in pleural mesothelioma has been shown to alleviate pain in the majority of patients treated; however, the duration of symptom control is short-lived. Single-agent and combination chemotherapy have been evaluated in single and combined modality studies. The most studied agent is doxorubicin, which has produced partial responses in approximately 15% to 20% of patients studied. Some combination chemotherapy regimens have been reported to have higher response rates in small phase II trials; however, the toxic effects reported are also higher, and there is no evidence that combination regimens result in longer survival or longer control of symptoms. Recurrent pleural effusions may be treated with pleural sclerosing procedures. However, the efficacy of these procedures depends on the bulk of the tumor. If the tumor is too large they may not be helpful. 1. Solitary mesotheliomas: Surgical resection en bloc (as a whole, or in one large piece) including contiguous structures to ensure wide disease-free margins. Sessile polypoid lesions (tumors sticking up from the pleura) should be treated with surgical resection to maximize the potential for cure. Palliative surgery (i.e., pleurectomy and decortication) with or without postoperative radiation therapy. Palliation means treatment to lessen side effects rather than treatment to try to cure the patient. Palliative radiation therapy. Palliation means treatment to lessen side effects rather than treatment to try to cure the patient. 1. Intracavitary chemotherapy (putting chemotherapy directly into the space around the lungs) following surgery to remove the cancer. 2. Multimodality therapy (using more than one mode of treatment). Treatment of symptoms including drainage of effusions, chest tube pleurodesis, or thoracoscopic pleurodesis. Pleurodesis is a medical procedure that uses chemicals or drugs to cause inflammation and adhesion between the layers of the pleura (the tissue that covers the lungs and lines the interior wall of the chest cavity). This prevents the buildup of fluid in the pleural cavity. It is used as a treatment for severe pleural effusion. Palliative surgical resection in selected patients. Palliation means treatment to lessen side effects rather than treatment to try to cure the patient. Single-agent chemotherapy. Partial responses have been reported with doxorubicin, epirubicin, mitomycin, cyclophosphamide, cisplatin, carboplatin, and ifosfamide. Combination chemotherapy (under clinical evaluation). Intracavitary therapy. Intrapleural administration of chemotherapeutic agents (e.g., cisplatin, mitomycin, and cytarabine) has been reported to produce transient reduction in the size of tumor masses and temporary control of effusions in small clinical studies. Additional studies are needed to define the role of intracavitary therapy. Treatment of recurrent mesothelioma uses procedures and/or agents (drugs) not previously employed in the initial treatment attempt. No standard treatment approaches have been proven to improve survival or control symptoms for a prolonged period of time. These patients should be considered candidates for phase I and II clinical trials evaluating new biologicals , chemotherapeutic agents, or physical approaches (new surgeries or radiation therapy approaches.) Biological therapies use the body's immune system to fight cancer or to lessen the side effects that may be caused by some cancer treatments.